Thank you for your interest in our Art Galleries at Put-in-Bay, Ohio! We provide service to both the private and corporate collector and present contemporary as well as traditional art that is accessible and affordable to the novice collector as well as established art connoisseurs. All of the galleries are located in historic downtown Put-in-Bay, Ohio. Representing a diverse group of artists ranging from plein air paintings and traditional aquatic crafts to contemporary abstracts and jewelry. You will find the art that you are looking for at Put-in-Bay. Since 1978, Wyland Galleries has been the art community's preeminent showcase for the finest in marine life paintings, sculpture and photography. 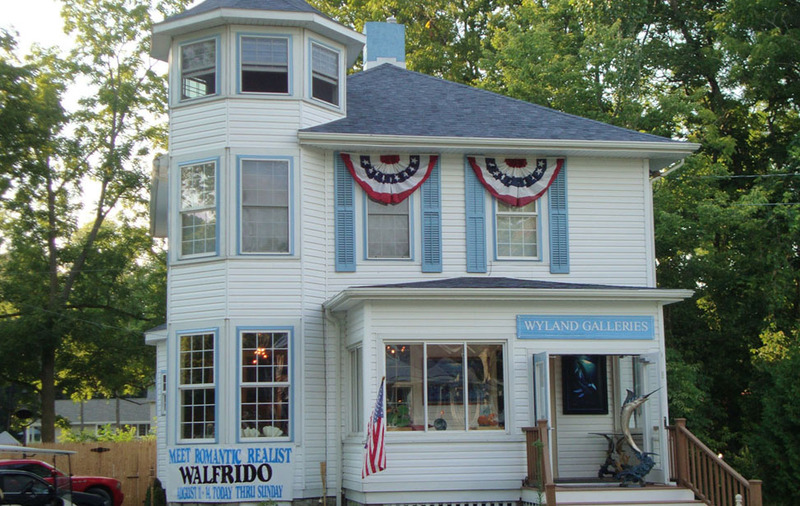 In the spirit of artist Wyland's original vision, Wyland Galleries continues to provide the highest quality fine art, and is considered one of the world's premiere fine art galleries, inspiring art lovers and collectors from over seventy countries. Put-in-Bay/South Bass Island Visitor! We need your help promoting our history, arts and culture, ecology, and recreation attractions. Whether you are an early bird or a night owl, downtown Put-in-Bay has shopping and entertainment options for you. Planning a trip to Put-in-Bay, Ohio doesn't need to be a daunting task. Enter our Free Weekend Contest! With thousands of active members, we publish specials and insider deals every month. Be the first to hear about island specials, theme weekend activities, and be entered into our twice yearly Free Weekend Contest! Don't let our quiet streets fool you: history meets hip in Put-in-Bay. Whether you want to shop 'til you drop, experience the great outdoors, go hundreds of feet in the air up the Monument, or immerse yourself in entertainment, this village on the lake has it all. Put-in-Bay Ohio is THE place for a great local staycation. We have island visitors ceom from Ohio, Michigan, Indiana, Illinois, Kentucky, Pennsylvania, West Virginia, and New York on a regular basis. But when it comes to family reunions or bachelor(ette) parties, Put-in-Bay sees guests come from almost every state in the Union, and Canada as well. The summer events cater to a broad range of interests so there is sure to be a Put-in-Bay Summer Event for you and yoru friends. Put-in-bay, Nicknamed the "Key West of the North" offers an exciting nightlife with live musical entertainment to satisfy all generations. Strolling Barbershop singers, bagpipers, steel drums and Ohio's best entertainers are frequently seen on Put-in-Bay island. Do you like history? Visit Put-in-Bay for Historical Weekend and the War of 1812 reenactments. Do you like to party? Come for one of the biggest Christmas in July parties in the USA. Do you want to relax with the kids? Spend a nice long midweek at one of our family-friendly Vacation Rental Homes or brand new Put-in-Bay Waterfront Condos. LIKE and FOLLOW us on Facebook to stay tuned on current events, specials, and great island news! Consider all the choices available for your adventure in Put-in-Bay. Whether you want to get out and play on the water or soak in some history with friends, or maybe both, be sure to browse the many options that await you. Experience our culinary treasures. You'll find quaint cafes, coffee houses, and our resident chocolatier intertwined with island dining experiences complete with ice cream and lobster bisque.